MILANO - Il Milan comunica di aver prolungato il contratto che lega il calciatore Massimo Ambrosini alla società rossonera, fino al 30 giugno 2010. 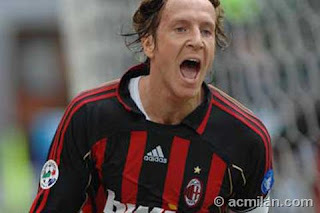 Massimo Ambrosini has eventually extended his contact at Milan for another three years. His contact was due to expire at the end of 2008, but the rossonero has found fine form after his return from injury, and it hasn't gone unnoticed. Il Guerriero (the warrior) has struggled in the last two seasons to remain fit, due to recurring injuries. But, he never stopped fighting to make a recovery, and return to first team action. This season he has done it in style for the rossoner, after going through psychological and physical problems earlier this year, Massimo has made a return worthy of a contract extension. He netted 3 decisive goals from Milan, all three landing up to be match winners. He has battled hard in the midfield for the rossoneri and his return has provided Milan with the depth that was missing so much at the beginning of the season . Not only does he help Gattuso to hold the midfield together, he can defend too. He provides Milan with more attack in the air, as many teams are still feeling the whiplashes of his headers that have earned Milan the three vital points seeing them win in the last minute. Ambro has always been a loyal Milanista and is often seen wearing the captains arm band for Milan. His great leadership skills has seen him win endless titles with Milan in the 11 great years that he has spent with the club. And by the time his contract expires, he will have spent 15 glorious years in the famous red and black shirt of Milan. Ambro is one of the fans favourite, as his hard working spirit drives Milan to go on further. His dedication was rewarded to him in 2005 when he netted home the away goal in the last few minutes of Milan's 3-1 (agg: 3-3) loss to PSV to see Milan through to the Champions League final. Unfortunately it didn't end well for Ambro and his team mates, but this year it could in the rematch of the 2005 final. And if Milan win the Champions league thi s season, it would Ambro's second Champions League title to his name. If Massimo manages to stay injury free he can be one of the best midfielders in the world, and no doubt he will scare even the strongest defence when it comes to his headering of the ball. We are all happy to see Ambro renew his contract, as it would mean seeing more of his hard fought battles in the midfield, and more of his trade mark late goals. And we are sure that there is more to come from il guerriero.